The Brighter Investment model, an investment in a student's higher education in return for a % of their future income, naturally results in a focus on the brightest students pursuing the degree programs with the best career potential. After all, the quicker the student gets hired, the higher their earnings are, and the lower their chance of unemployment, the higher the return on our investment. A higher return not only results in happy investors, but also in significantly more funding available for future students: higher returns result in more available student funding directly through faster growth of our assets under management, but also indirectly through more investors wanting to invest with us. The consequence of this focus on career potential and income, is that the majority of degrees Brighter Investment supports are programs in science, technology, engineering, medicine as well as certain business and finance degrees. Degrees in art and the humanities are examples of areas that we currently don’t support students in. 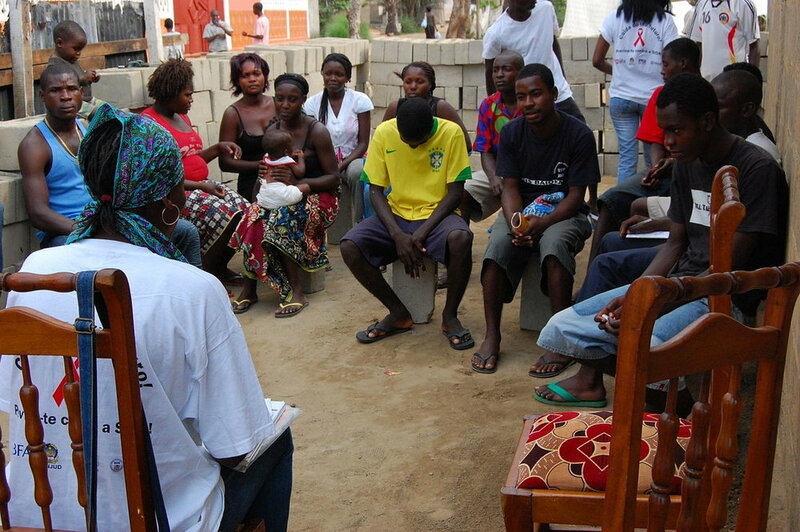 Carefully crafted HIV/AIDS educational outreach session like this one in Angola have done more to lowering its spread than medical interventions. We often get asked why not. After all, aren’t the arts not equally important to our society? Haven’t for example anthropologists contributed at least as much to containing the aids crisis as medical grads? And aren't there examples abound of very successful, very high earning professionals with a social science degree? So shouldn’t those degrees be funded as well? The short answer is ‘yes they should’. But at the current scale of a portfolio of 220 students, Brighter Investment isn’t the solution to everything, nor can it be expected to be. The unfortunate situation is that most students in developing countries who come from a poor background, no matter how talented, are unable to finance any type of higher education. Institutional investors are the only players in the market with the capital to solve this problem at scale. So our mission is to prove to these institutional investors that high potential students without a credit score are an attractive investment nonetheless. For certain degrees this claim is very obviously true: Ghanaian graduates with an engineering degree increase their income 5x and are 6x less likely to be unemployed when compared to their peers without that degree. For other degree programs the math is less obvious. Without a multi year successful track record to prove our claim that these students are worth investing in, we need to reduce the risks that investors perceive about our model wherever we can. One way to reduce this perceived risk is to reduce uncertainty around our students’ income potential by focussing on those degree programs where almost every graduate earns well. Percentage of US college-goers with student loans who have ever defaulted by age 33. College selectivity classifications are based on ratings by Barron’s which considers an institution’s acceptance rates, median freshman score on entrance exams (SAT, ACT) and the share of freshmen who ranked at the top of their high school graduating class. Sources: New York Fed Consumer Credit Panel/Equifax; National Student Clearinghouse. But what then you ask, when the company and the income sharing model take off? In North America after all, arts students pay the same interest rate on their federal student loans as engineering students. 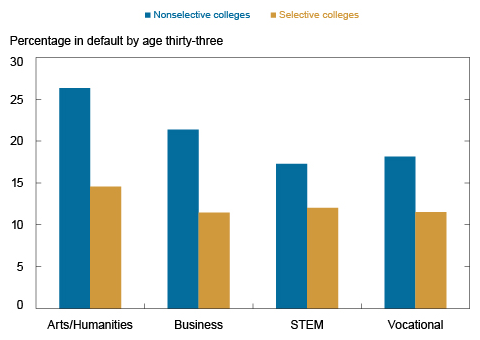 Higher default rates on those loans among art graduates are basically subsidized by lower average default rates for graduates with higher earning degrees. This model is currently at risk of being upended in the US. Private lending firms have identified this market imbalance and are offering cheaper loans, outside of the government secured pool, to low risk graduates with degrees that almost guarantee a successful career. This will reduce the financial performance of the loans remaining in the pool, and reduce sustainability of that pool if interest rates aren't increased. When the income sharing model takes off and makes higher education accessible to a large numbers of students, a number large enough to have a measurable impact on the ecosystem, it shouldn't just open up the opportunity to poor students to get an engineering degree, but open up the opportunity to get any good degree. And the word ‘good’ here is key. After all, no matter how important arts and humanities are to our society, no student should waste their time getting a degree in arts, humanities, or engineering for that matter, if that degree doesn't help the student get a job where what they learned is actually useful. Because unfortunately there are too many graduates that are under- or unemployed that will never get jobs where they benefit from their degrees. The reason for this is that either the quality of the degree is low to begin with, or because students aren’t taught how to turn the obtained knowledge into a viable career. Solving this problem is exactly the objective we have with our data driven underwriting algorithm. Brighter Investment only invests in 1 out of 20 qualified applicants, where a qualified applicant is an applicant that has been accepted for a degree we support, and has high enough grades to enter our application process. Beyond their grades and the degree program, we also look at personality traits as assessed by their teachers, we rate the applicant's drive, level of motivation, we take into consideration hurdles they’ve had to overcome to get to where they are today and many other factors. The improving quality of our underwriting is already starting to allow us to be smarter in which students we select. For example, in certain cases we select students with lower grades over students with higher grades, simply because we identified that the selected student had more potential. Yes that student may have had lower grades, but that was because of hurdles faced on the path to graduating high school (a situation frequently faced by women for example, because sons are more likely to receive family support). As explained above, right now our focus is on reducing risk as perceived by our investors, and so we invest in the obvious success cases. Over time, with more of a track record, more experience, and more collected data to tune our models, we will also be able to accept students that pursue a good art degree for example. An art degree where despite the degree program's high quality, the average graduate doesn't earn as well as graduates with other degrees. But based on the student’s personality, talents and drive as assessed by our selection algorithm, we will know that this bright student makes a good investment nonetheless. Much better in fact than an average engineering student. Our investments represent a partnership. A partnership where, through the time they commit to their studies, students make the largest contribution. This means that students should also see a good return on their investment. Our investments in education should benefit the student, the investor, and society as a whole. And through a data driven focus on probability of success, we'll ensure they will, for everybody. The future is bright!